All aboard the Cumbres & Toltec Railroad, America’s highest and longest coal fired, steam operated, narrow gauge railroad. The railroad was originally built in 1880 to serve the silver mines in the San Juan Mountains and is used today to show tourists the magnificent Rocky Mountains. Once the silver boom ended there was not as much need for this railroad and without a high demand it did not make economical sense to replace the rails to standard gauge. With no real use for this line the track was to be dismantled, but this did not happen. In 1970, Colorado and New Mexico jointly purchased the track, several buildings, steam locomotives, and train cars. With a little maintenance the Cumbres & Toltec Railroad was up and running, hauling tourist in 1971. Today you can still tour the railroad yards in Chama, New Mexico and Antonito, Colorado and see many of the buildings that were built during the railroad’s glory years. Today the railroad is still in operation and makes for an exciting journey through the Rocky Mountains. With its care in the hands of members whose mission is to “preserve and interpret the railroad as a living history museum,” the Cumbres & Toltec will be around for many generations to enjoy. 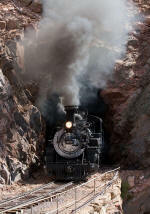 The trains depart daily (May-October) at 10 am from both Antonito, CO and Chama, NM. They both stop in Osier, CO where the passengers enjoy lunch. You have the choice of whether you would like to continue and complete the full ride, in which case you will be bussed back to your original destination, or catch a ride back to your starting destination via the train heading that direction. 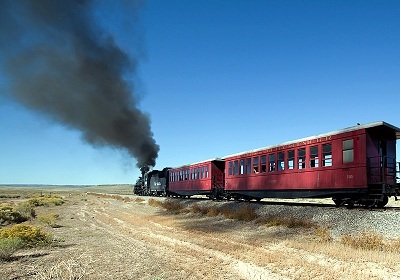 The Cumbres & Toltec Railroad also offer several specialty trains. 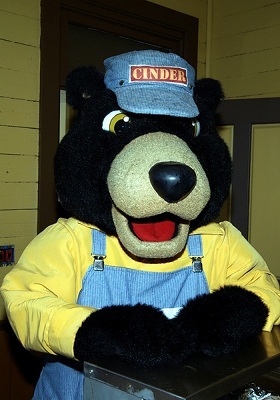 These trains can include Moon Night Dinner Trains to enjoy the views from a different perspective, a Cinder Bear Train which is especially themed for children with an appearance from Cinder Bear himself, and new in 2011 a Black Mesa Wine Tasting Dinner Train which will have a variety of local wines for tasting. Some of the specialty trains only run in one direction so please see the Cumbres & Toltec Railroad site for the full train schedule. As you leave either Antonito, CO or Chama, NM you will notice the terrain begin to change as you climb into the mountains. It is fun to watch the scenery change as different plants and trees grow at different elevations. As most of the journey is made at an altitude above 9,000 feet it is important to dress in layers and bring a jacket. Also make sure your body is physically capable of handling the altitude. As this is a coal fired steam engine it will emit cinders and soot. Some of the train cars are “convertibles” (they don’t have a roof), and it is recommended that you wear sunglasses when you are in these cars to protect your eyes from the soot. After the train begins to move you are free to wander around the different cars. I prefer the cars that are open to the air as this gives you the best feeling of being in nature. The best part of the whole trip in my opinion is the opportunity to see amazing mountain views full of life. There are many wild animals that call this area home and you can often see them from the train. I also enjoy the wild flowers that grow in the high mountain meadows and valleys. Perhaps the best time is in the fall when the trees are turning colors. With beautiful Colorado landscapes to enjoy during your entire journey it doesn’t really matter what time of year you ride the Cumbres & Toltec Railroad, you are sure to have a great time! Did You Ride This Scenic Railroad? Every trip has its own story to tell. We would love to hear about your experience about taking a step back in time. Click here to see the rest of the form and share your experience.